Eustasia "Taisy" Cleary has spent her life trying to live up to her father, Wilson's, expectations and gain his love. Seventeen years ago, Wilson left Taisy, her mother and her twin brother Marcus to make a new family with Carolina and their daughter Willow. They visited once, for Willow's first birthday, and haven't had contact since. But now Wilson has invited Taisy to visit, befriend her sister and write his memoir. 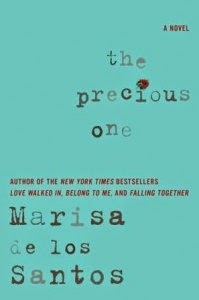 The Precious One by Marisa de los Santos is a wonderful story of family, love and the impact people have on one another, whether they are together or apart. I absolutely loved this story and the characters within it. Their thoughts, feelings and actions are genuine to who they are and what they have been through. Wilson, in particular, has a strong impact on most of the characters and this shows through in how they live their lives and the decisions they make. The story is told in the alternating voices of Taisy and Willow, who have the same father but are completely unique people due to who Wilson was when he raised them. Wilson was a distant father to Taisy while he doted on Willow to the point of isolating her from the real world. Now, Taisy is fighting to get out from under Wilson's influence after so many years. She turns to her former love, Ben, and tries to right the wrongs that happened so many years ago. At the same time, she is determined to uncover why Wilson turned out the way he did. Willow, on the other hand, is thrust into high school after being homeschooled her whole life. She is faced with several issues and decisions that are completely new to her. I feel I must say that some reviews have mentioned they don't like the way homeschooling is given a bad name in this novel, but I don't feel that way. In my opinion, Wilson's determination to protect and isolate Willow from the world is what caused her naiveté, not merely homeschooling. In many ways, Willow is a typical teenager trying to make her way in the world. I loved the way the characters grew throughout The Precious One, and the way the relationships evolved and became stronger in many cases. It was a beautiful story that I would highly recommend to fans of contemporary fiction. Connect with Marisa de los Santos on Facebook and Twitter. This review was written based on a copy of The Precious One that I received from TLC Book Tours in exchange for an honest review. This post includes an Amazon Affiliates link. This sounds like a wonderfully touching read - I can think of several people I should recommend it to! It really is a touching read. I'm so glad I read it! I have heard many good things about this book too. You featured two good books and two books that I still haven't read. It was very good. Thanks for stopping by!